Monsieur de Langle turned to me and said, Take a good look, Vaujuas, remember everything—when we get back to Europe this will all seem a dream. It seems pretty unfair to refer to Landfalls as a debut novel. Naomi J Williams spent ten years researching and writing it; by the end of a decade, your familiarity with your subject and your facility at writing about it will have improved markedly. On the other hand, having poured so much of your life into your first novel must make you pretty nervous about its reception. Williams ought not to worry, though; Landfalls has been getting spectacular reviews, and for good reason. It’s an amazingly confident novel that acts as a prism for a dozen different characters’ voices. Her research is lightly worn but thoroughly applied–always an impressive feat for historical fiction. She’s funny and poignant by turns. Many of the novel’s interrelated chapters force us to think deeply about how and why we give credence to certain ways of interpreting events while dismissing or downplaying others, but Landfalls is much more than an undergraduate exercise in unreliable narration. Indeed, the unreliability is not so much the point; it doesn’t matter that different versions of events are presented, because an authoritative narrative isn’t the aim. Williams is producing something almost pointillist, a proliferation of stories and lives that suggests the ripple effect of events. Some of the most affecting chapters aren’t set on board the ships of the Lapérouse expedition that forms the novel’s backbone, or even told by expedition members; instead, they show us how these Frenchmen circumnavigating the globe have an impact on everyone they meet, from the wife of a provincial governor in California to an unnamed indigenous girl in Alaska. It’s really, really hard not to bash your reader over the head with the fruits of your historical research. Williams manages it with a facility I haven’t seen in a contemporary writer since Hilary Mantel. Although the psychologies of her eighteenth-century France are less deeply plumbed than those of Mantel’s Tudor court, they’re just as nuanced. The opening chapter, in which Paul-Mérault de Manneron, the expedition’s naval engineer, is sent on a clandestine trip to London for maritime gear and advice, sets the tone perfectly. The period details are all there–the inconvenient length of coach journeys, the inclement weather on the Channel crossing, the uncomfortable lodgings and poor food–without seeming forced or artificial. Likewise, the rhythms of eighteenth-century thought are captured without resorting to pastiche. Lapérouse, who commands the expedition, thinks longingly and fondly of his wife Éléonore–he’s a good husband–but it’s clear that, though his affection is real, she’s much younger than he. There is no overt racism towards the indigenous peoples they encounter, at least not among the officers, but when native women are offered, most men do not refuse. Status and legitimacy preoccupy everyone: Lapérouse’s family purchased the surname for him in order to improve his career prospects, while the scientist Lamartiniére is incensed by the failure of everyone he meets to remember his name correctly and to accord him the respect he believes he deserves. Another scientist insists on signing all his letters with the title “Chevalier”. The book’s emotional range is also impressive. There’s no lack of sardonic humour, although some of its concerns are very serious. Manneron, for instance, has been told to tell anyone who asks him why he’s in London that he’s employed by a Spanish merchant, one Don Inigo Alvarez. He is, understandably, incredulous at the notion that anyone would actually believe this; “It sounds like something out of a play!”, he shouts at the naval minister who instructs him. He’s also shocked that, in England, wearing a sword makes you effeminate, but carrying a beribboned ornamental cane in public does not. But the book is ultimately about a scientific expedition to circumnavigate the globe at a time when such a voyage was incredibly dangerous. There is tragedy aplenty in Landfalls: two longboats are lost in a freak tidal accident; a landing party is clubbed and stoned to death by indigenous islanders; a ship’s chaplain wanders off to botanize and is found with his head bashed in. These aren’t spoilers; we know, for instance, that Lamanon will die on a beach at the hands of Pacific Islanders at the very beginning of chapter two, for at the moment that Williams introduces him, she tells us, casually, precisely how long he has left to live. She deserves praise for making us feel these deaths as deeply as her characters do. Lapérouse is devastated, for instance, by the loss of the longboats, and cannot write the condolence letters that it is his duty to compose; Langle, the second-in-command, gazes out of his cabin window and realizes that he cannot predict every direction from which disaster could strike. Flitting back and forth between the minds of the two men, we gain sympathy for both of them, but we’re never allowed to become locked in to just one point of view. The obvious strength of this approach is that it lets us view the expedition from many angles, including through the eyes of those affected by it. A young Inuit girl in Alaska narrates one chapter. She’s not presented as an exotic native specimen, but a fleshed-out human with interests and concerns that have nothing to do with the white men. Her cousin, who’s also her betrothed, has just died; she may have to marry his younger brother, who annoys her; the arrival of the Frenchmen is simply one incident in her life, not necessarily the defining one, and nothing much even happens when they do arrive. I appreciated that chapter as much for what it didn’t say as for what it did. I also appreciated that Williams makes it this way because it accords with the voice of the character; other indigenous women, such as the Siberian tribeswomen that the expedition’s Russian translator Barthelemy de Lesseps encounters, are silent, cheerful, and sexually licentious, and they are partly this way because we see them through de Lesseps’s eyes. He’s a good man but bounded by his time, and it would be too much to expect him to understand the contingent nature of the womens’ affection. Likewise, he fails to understand the nature of the love that his Russian guide, Goliakoff, has for him. The reader understands, though, and aches both for Goliakoff, who will never see Lesseps again, and for Lesseps, whose fear for his shipmates’ safety is somewhat assuaged by Goliakoff’s friendship, and who might have been better equipped to cope with his loneliness had he only realized what was available to him. The proliferation of viewpoints is also deployed within chapters, to create uncertainty. Texts are written by more than one person, or testimony is given by contradicting witnesses. An officer is ordered to write a report on a disaster, and is paralyzed by the task; Lapérouse writes draft after abortive draft of his condolence letters; Lamanon composes missives to scientific contacts back in France which never arrive, or which are left unopened on a desk. Communication is consistently figured as fraught, disappointing, impossible. It’s one of the aspects of living in the past that I consider the most distressing: not being sure whether your words have reached someone else, or ever will. High Modernism taught us that no one speaks precisely the same language as someone else, so communication will be contingent no matter how advanced our technology becomes, but having to physically wait, sometimes for years, to know whether your son or husband or father is still alive must have been beyond nervewracking. In Chile, Lapérouse knows that he may not hear from his wife again until he reaches Macao. That’s a sail of nearly two years. In such a world, and even further bounded, most of the time, by deck, sea and sky, no wonder most attempts at conveying information seem to be stymied. In Landfalls, Williams reclaims the emotional possibilities of the adventure-at-sea. Previously these have mostly been explored by male authors: Patrick O’Brian, for instance, whose Aubrey and Maturin novels beautifully evoke the deep brotherhood of seafaring men, or William Golding, whose Rites of Passage and its sequels show us the darker, crueller side of a claustrophobic life on board. It’s rare territory for a woman–quite possibly because there are supposed to be so few women in these maritime worlds, let alone writing about them–and Williams demonstrates to perfection that it needn’t be. 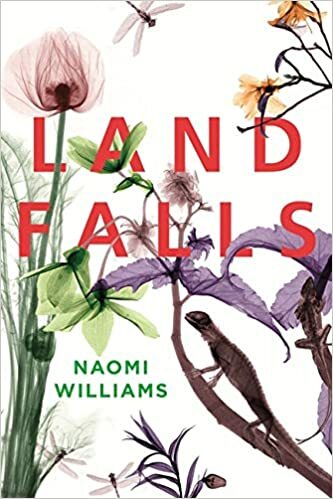 Landfalls is one of those rare books that would make a very good Christmas present for nearly anyone; with the present-buying season upon us, I hope its sales figures benefit. It’s an evocative, intelligent, wonderful book. Many thanks to Poppy at Little, Brown for the review copy! The point you make about communication is really interesting, Elle. I was thinking only this morning about the way in which the postal service has in fact declined. Virginia Woolf, a century ago, could post a letter in London in the morning and confidently expect to receive a reply that same day. Not even a first class stamp will necessarily get your missive there a day later now. But then there is the experience of my mother during the Second World War. My father was a FEPOW and she would get a card from the Red Cross every six months telling her that he had been alive six months earlier. Not so very different from the experiences of the characters in this novel. Has it been published yet? I haven’t seen any other reviews of it. It certainly sounds interesting. It was published two days ago–I’m hoping the Guardian picks it up; the Scotsman certainly has, but their review isn’t very descriptive! You make a good point about the Virginia Woolf-era postal service: not quite email, but pretty good. Now, I think, the proliferation of digital options means that our analogue choices are narrowing or are less good, meaning we’re all being slowly, subtly pushed to communicate digitally. Your mother’s experience sounds like psychological torment; whenever people talk about the Greatest Generation, I think about that, about families who knew nothing of where their loved ones were. Enduring that is greatness, to me. This sounds as good as I had imagined – so glad you liked it! There are so many things about this novel that appeal to me; a sea-faring adventure, multiple perspectives, historical content. Does the author make a note of what is fact and what is fiction? She doesn’t, but major events obviously happen, and there’s a fascinating bit where the official accounts of the deaths on the beach show some inconsistency, and no one can work out why until someone remembers vaguely that one of the Chinese sailors they’d taken on the year before was probably there. No one can remember his name, so he goes in the official report as “A Chinese.” My guess is that Williams saw that report and wanted to write about it, to fill in those blanks left by the formal record. She does it beautifully. I love the sound of this book being a huge fan of the Golding trilogy. Landfalls would be a winner on cover alone too, I hope it does well – I’ll certainly be seeking it out. Isn’t the cover gorgeous?! One of my favourites of the whole year. A great review of what sounds like a fantastic novel. I love historical novels and it is so hard to give the period details without it come across as obvious so that the reader is unsure whether they are reading a text book or a novel, even better when modern ideals aren’t overly applied to contemporary views of the time – I will be looking out for this one. Definitely do, especially if you like good historical fiction but even if you don’t! It’s pretty amazing writing, too, lucid and efficient without being spartan. Excellent review – I have this one to read but haven’t had the brain for it lately and I’d like to do it justice. I think the author should send you commission from the spike in her sales from this! Heehee, thank you 🙂 I totally know what you mean about not having the brain to do something justice, although Landfalls reads very smoothly–I was a little worried I wouldn’t be able to focus properly, but it didn’t make exorbitant demands of my attention, which was really nice. Call me intrigued! Is it bad of me to say that gorgeous cover alone makes me want to read this book? Not at all! The cover art was partly what did it for me.